"a superb piece of theatre which has a dreamlike quality and blends cultures audibly and visibly"
Helen was commissioned by Theatre Centre to compose the music for an opera adaptation of the children’s classic novel THE SECRET GARDEN by Frances Hodgson Burnett. 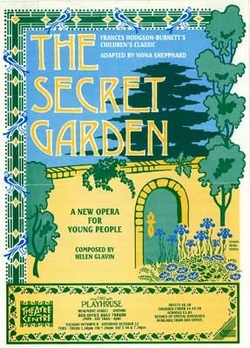 With a libretto by Nona Shepphard, the original production was funded by the Arts Council of Great Britain.This magical opera for young people and family audiences was nominated for the TMA/Martini award. Helen’s music combines the multi cultural elements of the story into a rich and haunting score for singers and a diverse ensemble of instruments including sitar, tabla and African drums.